Driven by rising home prices and growing demand, the U.S. housing recovery is well underway, according to our latest State of the Nation’s Housing report released today. While still at historically low levels, housing construction has finally turned the corner, giving the economy a much-needed boost. But even as the recovery gains momentum, millions of homeowners are still delinquent on their mortgages or owe more than their homes are worth, and severe housing cost burdens have set a new record. Driven by an increase of 1.1 million renter households, last year marked the second consecutive year of double digit percentage increases in multifamily construction. 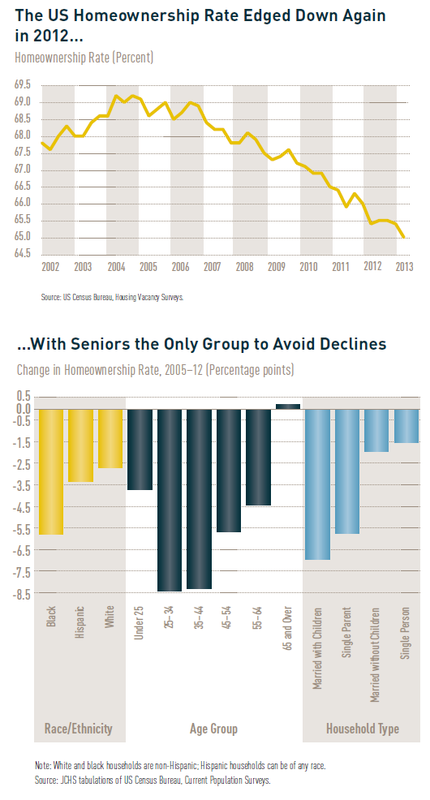 But the flip side of the strong rental market was the continued slide in homeownership rates. Even as historically low interest rates have helped make the monthly cost of owning a home more favorable than any time in the past 40 years, the national homeownership rate fell for the eighth straight year in 2012. The drop was especially pronounced for 25–54 year olds, whose homeownership rates were at their lowest point since recordkeeping began in 1976. Note: White and black households are non-Hispanic; Hispanic households can be of any race. Source: JCHS tabulations of US Census Bureau, Current Population Surveys. Tight credit is also limiting the ability of would-be homebuyers to take advantage of today’s affordable conditions and likely discouraging many from even trying. At issue is whether, and at what cost, mortgage financing will be available to borrowers across a broad spectrum of incomes, wealth, and credit histories moving forward. And while the recovery is good news for many, the number of Americans shelling out half or more of their incomes on housing is at an all-time high. At last count, 20.6 million households were shouldering such severe burdens, including nearly seven out of ten households with annual incomes of less than $15,000 (roughly equivalent to year-round employment at the minimum wage). But, the report notes, even as the need has never been greater, federal budget sequestration will pare down the number of households receiving rental housing assistance. Notes: Severely cost-burdened households spend more than 50 percent of pre-tax income on housing costs. Incomes are in constant 2011 dollars, adjusted for inflation by the CPI-U for All Items. With rising home prices helping to revive household balance sheets and expanding residential construction adding to job growth, the housing sector is finally providing a much needed boost to the economy, but long-term vacancies are at elevated levels in a number of places, millions of owners are still struggling to make their mortgage payments, and credit conditions for homebuyers remain extremely tight. It will take time for these problems to subside. Given the profoundly positive impact that decent and affordable housing can have on the lives of individuals, families, and entire communities, efforts to address these urgent concerns as well as longstanding housing affordability challenges should be among the nation’s highest priorities. Download the 2013 State of the Nation’s Housing report.